Linda Fleming’s (American, b. 1945) intricate maquettes are the heart of her creative process. Created from wood, paper, or steel, each is delicate yet structurally sound. While some maquettes have later been made into large-scale sculptures, many exist as completed work in this smaller scale. The maquettes represent diagrams of Fleming’s creative thought processes. Abstracted patterns reference the cosmos and nature, while the architectural structure grounds the work, both physically and metaphorically. This exhibition originated at the University of Nevada Museum of Art and is expanded for its presentation at the University of Wyoming Art Museum. In addition to the more than 60 maquettes, a full-scale work, Fumerole, will be on view on the Art Museum’s sculpture terrace, referencing how her forms function in small and large renditions. Fleming maintains studios in the San Francisco Bay area, Nevada, and Colorado. She was a founder of the 1960s Colorado artist community Libre, which embraced the idea of creating a utopian setting for art making. Funded in part by the Edelweiss Fund, the UW Art Museum Gala Fund, and the Wyoming Arts Council through the Wyoming State Legislature and the National Endowment for the Arts. Linda Fleming discusses her intricate maquettes which are the heart of her creative process. 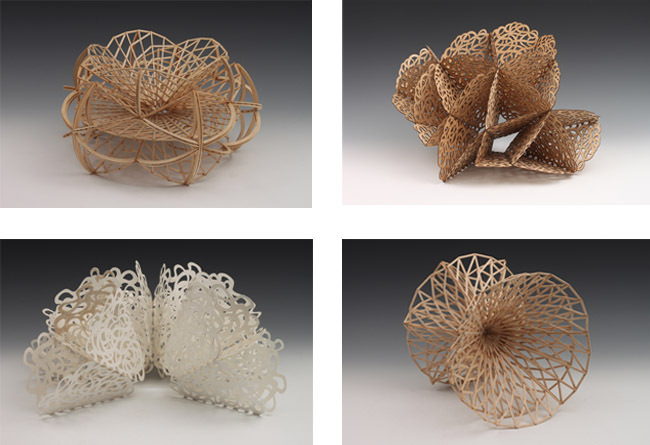 Created from wood, paper, or steel, each is delicate yet structurally sound. While some maquettes have later been made into large-scale sculptures, many exist as completed work in this smaller scale. The maquettes represent diagrams of Fleming's creative thought processes.